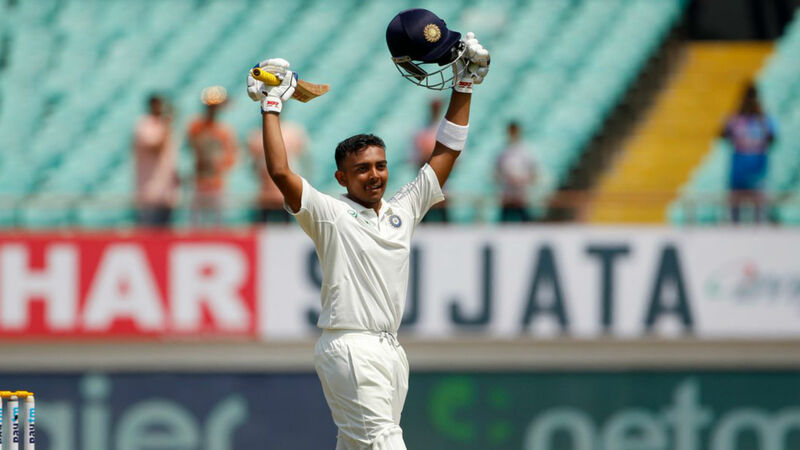 Teenage India debutant Prithvi Shaw was grateful for "many boundary balls" from a depleted West Indies attack in a historic Test century, which he dedicated to his father. Shaw went down in the record books by becoming the youngest player to score a hundred on debut in the longest format, making a magnificent 134 from only 154 balls on day one in Rajkot. The 18-year-old opener took only 99 deliveries to reach three figures, the third-fastest in a Test bow in terms of balls faced, as the Windies struggled in the absence of Jason Holder, Kemar Roach and Alzarri Joseph. Shaw struck 19 boundaries in an outstanding knock and the prodigy was elated after grasping his opportunity on an opening day of the two-match series that ended with India 364-4, Cheteshwar Pujara making 86 and Virat Kohli 72 not out. "Obviously I was nervous. This was my Test debut." said Shaw. "But after 10 overs, I was hitting the ball well and I was getting the boundaries. "I got the confidence and I didn't feel the pressure. I wanted to dominate them as much as I could. I like dominating the bowlers and I was trying that. "I was waiting for the loose balls and they bowled many boundary balls. So I was trying to balance it out between playing the ball on its merit and attacking the loose balls." Shaw added: "I want to dedicate this hundred to my dad; he has made a lot of sacrifices for me, [and] he is still doing it. "He has been very helpful throughout my journey. He has always been there, whenever I have been nervous or have gotten out early. I can't list it all out but he has done a lot."